Tonight I had the unexpected pleasure of meeting "Jane" Ngarmpun Vejjajiva (งามพรรณ เวชชาชีวะ). She's best known as the author of the 2006 S.E.A. 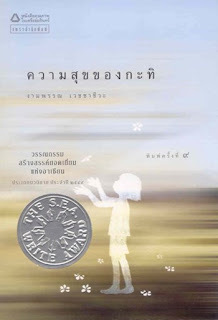 Write Award-winning novel(la) ความสุขของกะทิ (see my review), translated into English as The Happiness of Kati, and with a film adaptation currently in Thai theaters. The occasion was a fundraising fair for the Thai Fulbright foundation, which oversees Fulbright grantees to/from Thailand, like me. A number of senior Thais are former Fulbright grantees, including a Fellow of the Royal Institute who I met tonight. Jane was there to help raise money, selling signed copies of the book that made her famous. I snagged one for my collection, naturally, but I also thought of you, dear reader. My copy is inscribed with ขอมอบแด่คุณริกเกอร์. The one I'm giving away is just her signature and the date: 31/1/52. This is a brand new copy of the 62nd (!) printing of the book, printed January 2009. The cover shown is the 9th printing, but otherwise it looks the same. To enter this little contest, just send me an email (preferably with "Thai 101" somewhere in the subject line). Let's make the cutoff, say, next Sunday, February 8th. Anyone in the world is welcome to enter. It's a very slim book, so I'll stick it in a padded envelope and ship it off to pretty much anywhere. Note that this is the Thai language edition, not the English translation. Just a heads up. You're still welcome to enter even if you just want it for a souvenir. I'll make the decision next weekend, and if you win I'll write you to ask for your mailing address. I asked Jane how work was going on her latest projects, and she said her next book will be released in February. So keep an eye out for that, too. Only a few short years ago, the wealth of media from the 1980s was trapped in cultural limbo, in the post-cassette, post-VHS, pre-YouTube world. Now, thanks to the wonders of the internet, we can all enjoy music videos like the 1982 classic ประตูใจ ("door of the heart"), from the album of the same name, by the pop trio สาว สาว สาว (Sao Sao Sao). You may remember it from the adorable 2003 film แฟนฉัน Fan Chan. See also my personal favorite of theirs, ใจโทรมๆ, from their 1989 album หมื่นฟาเรนไฮต์ ("10,000 degrees Fahrenheit"). Honestly, though, not being an original Micro fan I prefer the Zeal cover, from 2003's Little Rock Project. Embarrassing but true: When I heard this cover all over the radio, I didn't know who sang it, but I wanted the album, so I had to resort to singing it to the clerk at the record store. She pointed me to the right album, though. And with that, you've now scratched the surface of 1980s Thai pop/rock. If you watched them all, you officially passed the crash course. What's your favorite band from this era? Stumbled across something new at 7-Eleven today: Pepsi Green. Naturally, I had to try it. I probably should've known better. The can is bright green, and the liquid inside looks like a green M&M drowned inside a bottle of Listerine. While in a nuclear reactor. In Boston on St. Patrick's Day. It's really green. Before making my purchase I scoured the can for hints as to what flavor lay in store, but no luck. The ingredients: sugar, natural flavors, artificial flavors, artificial colors, preservatives, and of course caffeine. So I asked the clerk what flavor this is supposed to be. She said she thought it was a mix of cucumber and kiwi. Believe it or not, I still bought it. Well, it's nothing like cucumber or kiwi. I can't quite put my finger on it, actually. It has a spice-y taste. Not spicy, but spice-y. I'm not good with differentiating spices, but there's something not unlike cinnamon in there. I also wondered if green tea wasn't a likely ingredient, but in this market that would be a selling point, so I'm sure it would be plastered all over the can, if so. No info on pepsithai.com about this new product, either, but message boards the web over are abuzz over what exactly this stuff is. 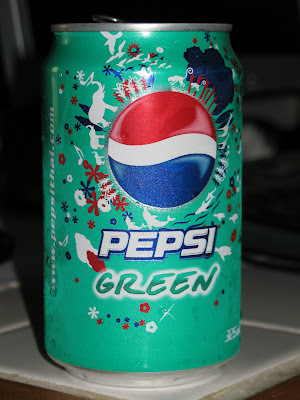 Anyway, I think that was the last can of Pepsi Green I'll buy. Just bizarre. Over on the website of the Bangkok International Book Fair is an interesting page with lots of stats about the Thai publishing industry for the years 2003-2007. First, an interesting stat about the reading habits of the Thai public: Thais are estimated to read only two books per year for pleasure, and spend 285 baht ($9 USD) per year on books. I wish they would clearly define what they mean by this. Do magazines count? Newspapers? Comic books? I'm thinking no, but can't say for sure. The good news is that this number is one the rise: the amount spent on books per person in 2003 was only 166 baht. I'm of the opinion that most "bookstores" in Thailand are glorified magazine racks, but regardless the number of them has increased dramatically, according to a report compiled by Se-Ed Bookstore: 678 in 2003, 955 in 2006, and 1913 (!) in 2007. That's a 100% increase in one year. Sounds like they might have changed their definition of what constituted a bookstore, to be honest. In 2003 there were 374 publishers in Thailand (defined as registered members of the Publishers and Booksellers Association of Thailand). By 2006 that was up to 492, but down 491 in 2007. Interestingly, the smallest gain from 2003 to 2007 was in the small category; medium publishers increased from 44 to 70 (a 60% increase); and large publishers increased from 20 to 40 (a 100% increase). Between 2006 and 2007, there was actually a net loss of small publishers. Despite the relatively little reading doen by the average Thai, the total revenues of the publishing industry in Thailand increased by more than 70% between 2003 and 2007, from 10.5 billion baht to 18 billion baht. The page doesn't contain these statistics explicitly, but doing some basic math (always dangerous for me), I calculated the average income for publishers in each of the three categories. In 2007, the average large publisher took in 282.5 million baht in revenue, versus 300 million in 2003 (a 6% decrease). The average medium publisher had 64.3 million baht in revenue in 2007, compared to 56.8 million in 2003 (a 13% increase). And in 2007 the average small publisher had 5.8 million baht in 2003, versus 6.4 million baht in revenue in 2003 (a 9% decrease). The market getting crowded, perhaps, but the overall market is growing healthily. New titles per year only slightly increased from 2003 to 2007, from 10,108 to 11,455. With the increase in publishers, though, this means that average new titles per publisher fell, from 27 to 23. This doesn't account for existing titles, though, and there are plenty of books still in print several years (or even decades) down the road. I'd like to see some statistics on total titles per publisher. Reading all of this, I wonder how print-for-hire services offered by the likes of Amarin, both a publisher and a printer, are factored into all this, both in revenue and title counts. Having been out there recently, I now know they routinely do mini-print runs of as little as 300 copies, and the quality of the printing is just as good as anything out there in Thailand. I imagine many (if not most) of these for-hire titles are never sold to the general public, and instead are published for some specific occasion or limited purpose, though I don't know for sure. Despite its growth, the publishing industry is (not surprisingly) miniscule when compared with Thailand's overall gross domestic product. In 2007, the publishing industry took in 18 billion baht, compared with a nearly 8.5 trillion baht GDP. That's a puny 0.21% of the GDP. It's interesting to compare the facts and figures there to the figures from the United States. (That page is very scattershot, but I'm not about to shell out cash to read the Barnes report on the U.S. publishing industry.) The Association of American Publishers site also has some information. If you know of other, better free sources for publishing data, let me know. 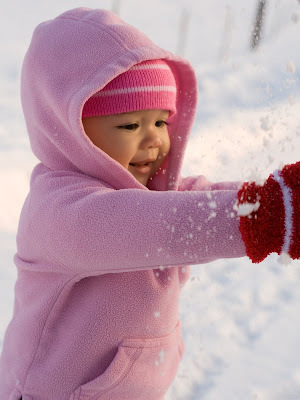 For example, in January 2009, book sales tracked by the AAP were down 4.4%, to $743 million. That's 25 billion baht, or nearly 150% of the annual revenue of the entire publishing industry of Thailand, in one month (and a bad one, at that). If we estimate average annual book sales in the U.S. at 8 billion USD, or roughly 280 billion baht, that means the average American purchases $26 (~900 baht) in books per year (dividing by 300 million -- parents buy books for infants, too). When you factor in the difference in books prices, though, that's actually quite similar to the Thai number of 285 baht per year. If you're interested in this topic, do click over and read the full stats for yourself. Here's to hoping the Thai book industry continues to grow. Only a few readers probably know that I was awarded a Fulbright grant from the U.S. Department of State to come to Thailand to conduct an independent research project in linguistics. Due to an excess of bureaucracy and a plate full of other things to do in the meantime, I am only just now formally beginning this project. My recent return to Bangkok means I'm official: my Fulbright project was approved by the National Research Council of Thailand. The project, at its heart, is simple: improve accessibility to Sukhothai-era inscriptions. Why Sukhothai? Because you have to start somewhere, and you can only do so much. The Sukhothai inscriptions comprise some 20,000 words of text. The work I do on this relatively small subset will help me do a better job on the rest of the stone inscriptions of the Tai-language tradition. They're also the oldest Thai writings, so it's a logical starting point. Two Thai professors have kindly agreed to be my advisors on this project: Dr. Udom Warotamasikkhadit (ศ.ดร.อุดม วโรตม์สิกขดิตถ์) and Dr. Prasert Na Nagara (ศ.ดร.ประเสริฐ ณ นคร), both fellows of the Royal Institute (Dr. Udom is also currently Secretary of the Academy of Arts). They are both busy men, and I am very grateful to them both for their support of my work. In particular, Dr. Prasert is a giant in Thai epigraphy. He turns 90 this year, but still serves on numerous committees of the Royal Institute. He's there every day, Monday to Friday. One such committee is working on the forthcoming Dictionary of Ancient Words (พจนานุกรมโบราณศัพท์). Dr. Prasert is practically a household name, so it was an honor to finally meet him last year. Dr. Udom is also one of the fathers of modern linguistics in Thailand, having written a now classic word on Thai syntax as his Ph.D. dissertation in 1963, and numerous books since. I first met him in 2005, when I was working on my senior thesis for my B.A. He has always been very encouraging and helpful to me. The tone and content of this blog jump around a lot, but I hope I won't be scaring too many readers away if I use it as an outlet for topics that grab my interest in the course of my research. Finally, I'll reiterate that this project would not be underway if it weren't for the Fulbright Program, which saw some value in letting me loose on a topic that I'm not "qualified" to tackle. I know I have something to contribute, though, so I'm grateful for the opportunity. I'm really jumping in the deep end here, but I'm loving it. Stay tuned. 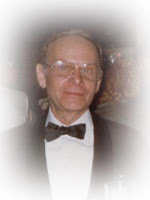 Domnern Garden (ดำเนิน การเด่น), born 1928, lawyer, translator, and lexicographer, passed away on Monday, January 19, 2009. He was 81 years old. Best known by the general public for his Thai-English dictionary, co-authored with Prof. Sathienpong Wannapok (เสฐียรพงษ์ วรรณปก), a fellow of the Royal Institute. The Third Edition of the dictionary is the finest Thai-English dictionary of recent years. A native of New York, Domnern Garden later became a naturalized Thai citizen. He graduated from Harvard Law School and was admitted to the Thai bar. Soon after, he was recruited by Ina Jorgensen to work at Jorgensen & Co., the premier intellectual property law firm in Thailand. Today the firm is known as Domnern Somgiat & Boonma. Domnern retired a number of years ago, but the firm continues to be a giant in local IP law, with 60% of patent applications and 20% of trademark applications in Thailand made through the firm. Domnern translated the award-winning short story collection ฟ้าบ่กั้น by National Artist Khamsingh Srinawk (คำสิงห์ ศรีนอก), written under the pen name ลาว คำหอม, into English with the title The Politician and Other Stories. He also formerly taught law at Thammasat University. I, Barack Hussein Obama, do solemnly swear that I will faithfully execute the office of President of the United States, and will to the best of my ability, preserve, protect, and defend the Constitution of the United States. The actual oath varied a bit from the script. Regardless, I think it's a very nice translation. The MK dance: fun or embarassing? If you eat out in Thailand much, chances are you've eaten at MK, the ubiquitous and beloved steamboat (a.k.a. suki) restaurant. It's found in virtually every shopping center. It's so popular, the larger malls have more than one. I've eaten there loads of times, but only recently did I see ... the MK staff dance. At the stroke of 7:00 p.m., the entire wait and bus staff began to dance in unison. Part classical Thai dance, part YMCA, no employee in sight escapes its reach. I wondered if they were also dancing in the kitchen. The MK dance is a bit much for me, I'm afraid. At dinner the other night, the look on the face of one girl was so pained that she may have been passing a kidney stone at the same time. I can't be sure. According to a recent article in the Nation, some patrons find the MK dance so much fun that they have formed a club to join along. Now that I want to see. Call me a boring westerner, but I filled out a comment card telling them that I don't think they should force their employees to dance. It wouldn't have bothered me so much if they didn't look like they were hating it. The dance changes from time to time, too. 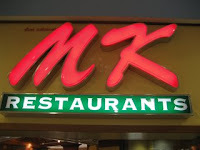 Search for "MK dance" or "MK restaurant" on YouTube for loads more clips. Have you seen the MK staff dance? What did you think? I've written before the excellent FSI-language-courses.com, which distributes user-digitized pdf and mp3 files of public domain Foreign Service Institute language courses. For whatever reason, the man behind the original site hasn't been active on it for several months. Since the site exists on user contributions, though, folks have continued to digitize FSI course materials in the meantime. Finally, a word to the wise: Since FSI materials are in the public domain, third parties are free to repackage and resell them, usually at absurd prices. Prior to the internet, this was actually a useful service, since FSI courses can sometimes be hard to track down. Nowadays distribution is no problem, and the number of opportunistic sites selling FSI materials has increased. This is still legal, but I think it's distasteful. And the worst part is that in all likelihood they're just selling you a CD with the pdf and mp3 files taken from these free sites, which are quite good quality. Be warned. Is it that time again already? Well, not quite, but it's time for me to start budgeting. Details are now available for the 37th National Book Fair. The annual event is held at Queen Sirikit National Convention Center. This year the fair will run from March 26 to April 9 April 6, 2009, from 10:00am-9:00pm each day. The fair originally stemmed out of National Book Week, but the fair has proven so popular over the years that it's now a full nearly two weeks, and held twice a year (the October version is called Book Expo Thailand). According to their website, attendance at the fair was 1.2 million in 2006, up to 1.5M in 2007, and 1.7M in 2008. And last year total sales from the event equaled USD$13M. That's nearly half a billion baht. Wow. As usual, the fair also coincides with the Bangkok International Book Fair, now in its seventh year. While the majority of books on sale are in Thai, there are actually plenty of English (and other langauge) books to be found, too, both secondhand and new. AsiaBooks usually has very good discounts; last time I recall it was 20% across the board, and they also had an "outlet" booth with even lower prices. And last year, out of 870 booths, 105 were run by international publishers, from 17 countries. I generally go for the book shopping, but they always have a number of interesting book-related events during the fair. There are author signings, seminars, and other things of a bookish nature. No details on those yet, but I'll keep an eye out. I managed to keep myself busy and distracted with other things for ten -- count 'em -- ten weeks. The momentum of sloth is hard to overcome sometimes. Many apologies. But after 25 hours of travel, a bit of rest, and all the green mango I can eat, I'm back. Both physically and mentally. Starting now I'll again be posting regularly on Thai 101. I've got books to give away, questions to answer, and a ridiculous number of half-written posts to complete (41, to be precise). Analytics tell me that readership has actually increased since I dropped off the face of the earth, funnily enough. I get a lot of my energy and momentum to write from you all, so please, send emails, leave comments, stalk me on Facebook, what have you. Tell me what you want more of, less of, exactly the same amount of. I know I tend to start topics and then never get back to them. Such is the way my brain works. But for me, what I enjoy most about blogging is the dialogue and sharing of ideas.